Discussion in 'Jailbreaks and iOS Hacks' started by jvice09, Dec 20, 2014. Like the title says, I really like the idea of combining the app switcher with control center. 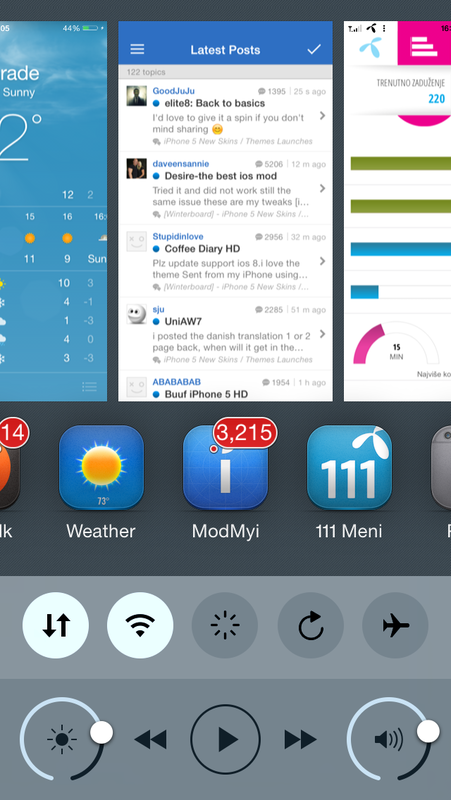 I was using Auxo2 on iOS 7 and patiently waiting for Auxo on iOS 8. In the meantime though, I have been trying out Vertex which does the job, but doesn't feel quite as native as Auxo2. Combined Vertex with Slide2Kill8 Lite and it gets the job done, but I was wondering what other tweaks are out there that you guys like to use, similar to these two? yea, i know its about to come out soon (christmas perhaps?) and i will definitely be switching over. just saying that vertex is pretty decent to use in the meantime for those still waiting. I am trying to get swipe up to close along with vertex. Means vertex works on home screen and using activator for swipe up for showing first springboard page. However there is a very bad UI jerk. They overlap. Means first vertex launches for a millisecond and then goes to the first page. Are u doing anything to achieve similar results? Already out. Just downloaded. Which is the best option for adding more toggles with auxo? CCSettings, had it before I installed Auxo 3...it's all there, as it should be. Is this better than Tage or you guys have both installed together? Way better than tage imo. Thank you! Gonna try out Auxo and uninstall Tage. Thanks. Installed CCS and all is good. The bottom icons of the switcher are way closer than they are on my iPhone 6. How are yours so close to each other? Hope. I meant the icons in the multi tasking pane. The apps which are open. I was thinking of the same. Makes sense since I have an iPhone 6.